Evening Primrose Oil comes from Oenothera biennis (common known as evening primrose), a wildflower found in North America, Europe, and parts of Asia. The seeds are unique because it is one of the few oils that contains high amounts of gamma linolenic acid (GLA), an omega-6 essential fatty acid that plays an important role in our body. 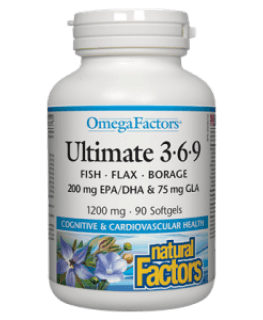 Omega-6 fatty acids are needed to produce the hormone prostaglandins, particularly PGE1, which helps to maintain and regulate bodily functions. Evening Primrose Oil can be used to alleviate irritated skin conditions such as acne, eczema and psoriasis as well as relieving discomforts associated with premenstrual syndrome. 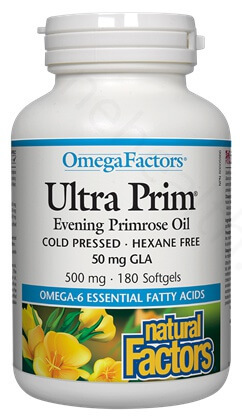 What Are the Key Health Benefits Associated with Natural Factors Ultra Prim? Why is Natural Factors Ultra Prim so unique? 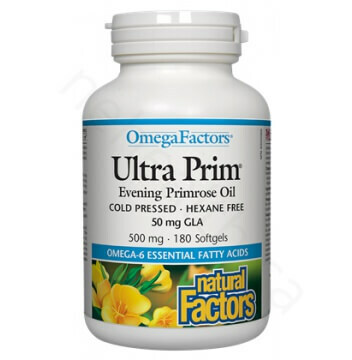 Natural Factors Ultra Prim is made from the highest quality evening primrose oil, extracted using a gentle method called cold pressing. This method crushes the seeds to release its nutritional oil, without the use of heat or any other harsh solvents such as hexane. Cold pressing enhances the stability and preserves the nutritional components of the oil. Ultra Prim is also ultra-purified to remove any organic residues or impurities. Non-medicinal ingredients: Softgel (gelatin, glycerin, purified water) , vitamin E.
Wright, S., and J. L. Burton. "ORAL EVENING-PRIMROSE-SEED OIL IMPROVES ATOPIC ECZEMA." The Lancet 320.8308 (1982): 1120-1122. Chenoy, R., et al. "Effect of oral gamolenic acid from evening primrose oil on menopausal flushing." Bmj 308.6927 (1994): 501-503. Khoo, S. K., C. Munro, and D. Battistutta. "Evening primrose oil and treatment of premenstrual syndrome." The Medical Journal of Australia 153.4 (1990): 189.